The Indian Creek community is just off Formosa Gardens Blvd. It is one of the very closest communities to Walt Disney World. The first of Indian Creek's play areas is centrally located and only a short walk from Storytellers. It features climbing areas, slides and swings. In the Centre Square play area, swings are available in two sizes - for the young, and the young at heart! Also located in the Centre Square is an outdoor gym, suitable for all ages. The field of the Centre Square has a soccer goal (not pictured) for those inter-house games. The Recreational Grounds at Indian Creek are just across the street from Storytellers Villa. They feature an elaborate children's play area. 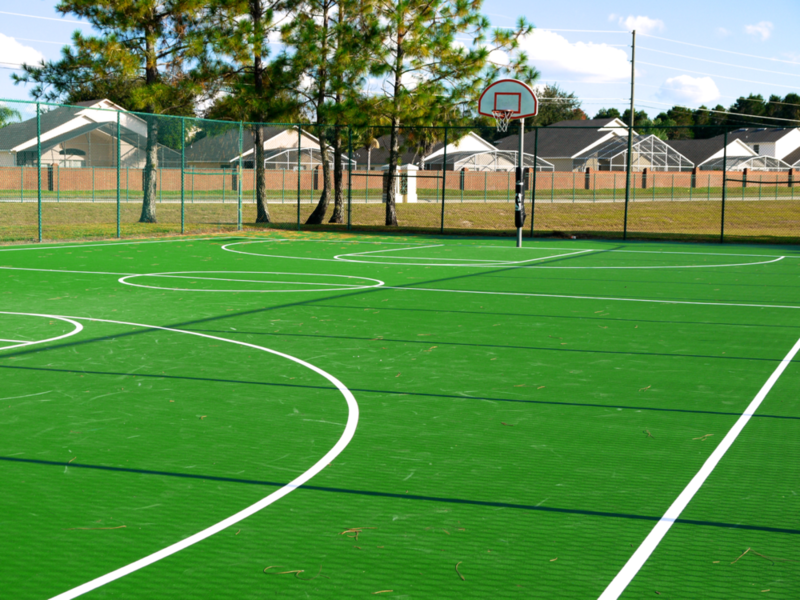 The recreational grounds include the use of a newly resurfaced outdoor basketball court. Tennis racquets and a couple of tennis balls are available at Storytellers Villa so you can enjoy the tennis courts at the Indian Creek Recreational Grounds. Just opposite Storytellers is a lake with a surrounding pathway and benches. Perfect for running, walking or simply taking in the beautiful landscape.